Studying abroad opens our children’s eyes to new ways of thinking about the world. It helps our children learn to solve problems in cross-cultural contexts, supports critical thinking skills and allows them to acquire international experience, an increasingly important component to a college graduate’s resume. Many parents, though, do not know how to effectively help their children prepare for and leverage the experience. International careers expert Stacie Nevadomski Berdan and IIE President Allan E. Goodman (coauthors of A Student Guide to Study Abroad) and AIFS President William Gertz have written a new book that arms parents with the practical information to get involved with their child’s study abroad experience, but also to give them the independence to learn and grow on their own. The best-selling A Parent Guide to Study Abroad offers much-needed straight talk on how parents can and should participate in one of the most important decisions of their children’s academic career. 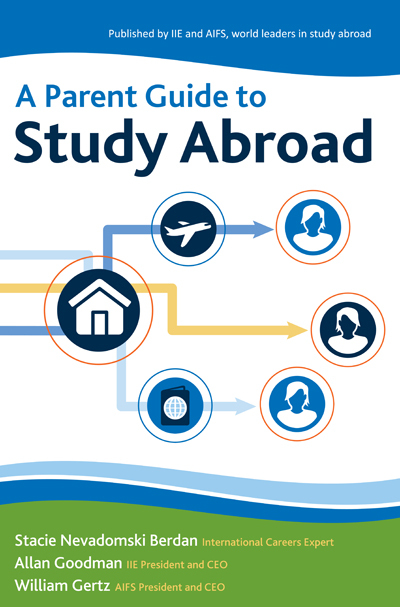 This short guide is a must-have for families seeking to better understand the ins and outs of study abroad and how it enhances a student’s path to success in college and beyond. A companion guide to the comprehensive A Student Guide to Study Abroad.